Places no longer available. Check out our Training Contract and Vacation Schemes Conference! Non-law students and graduates, The Lawyer Portal presents its first staple conference just for you: the Law Conversion Conference, in partnership with BPP University Law School! The Lawyer Portal, in official partnership with the Bar Council and CILEx, engages with some of the most renowned firms across the globe, including Herbert Smith Freehills, Dentons, Hogan Lovells and more. Why should you convert to law? Why are non-law students/graduates desirable to firms and chambers? How can you get funding for your GDL? How can you excel in your applications and ace every interview at law firms and chambers? Want more targeted information about getting a training contract? You can also attend one of our Training Contract and Vacation Scheme Conferences for just £5! Law Conversion Conference: Why Should I Attend? You will also receive a free goody bag, including gifts from firms, companies and all the information you need to start applying! Law Conversion Conference: What Do Other People Say About Our Events? Our Law Apprenticeship Conference in March scored an average of 4.3 out of 5 stars when asked how they’d rate today’s event, and 96% of attendees would recommend it to a friend. Whilst at our Training Contract and Vacation Scheme Conference, attendees rated the event an average of 4.6 out of 5 stars and 96% said they would recommend it to a friend. Workshop 5 STEM & Humanities - What Makes You Different in a Good Way? Remember, each workshop will run a number of times throughout the day, so if you miss one slot, you can always attend the same workshop but at a different time. There will also be two Q&A panel sessions where you can ask the experts everything you want to know about Law Conversions. For venues, visit our Conferences: Dates, Venues & Times page. Take a look at these articles to get yourself riled up for the Conference! Having sold thousands of tickets to our TLP Aspire nationwide events, The Lawyer Portal now brings you one of our biggest conferences yet: the Law Apprenticeship Conference, in partnership with BPP Law School. Officially partnered with The Law Society, The Bar Council and CILEx, TLP works with some of the biggest law firms across the world, including Herbert Smith Freehills, Dentons, Hogan Lovells and more. Our next conference, delivered by lawyers and legal educators from top institutions, will give you the expertise to secure an apprenticeship, from making your application right through to your first day in the office – and it’s completely FREE! Why not also take a look at our free event for school/college-age aspiring lawyers? TLP Aspire is the unmissable, nationwide series of free events, detailing what a career in law really means. Are you are teacher looking to make a group booking for your students? Please fill in the group booking form here. You can download our Law Apprenticeship Conference poster here. 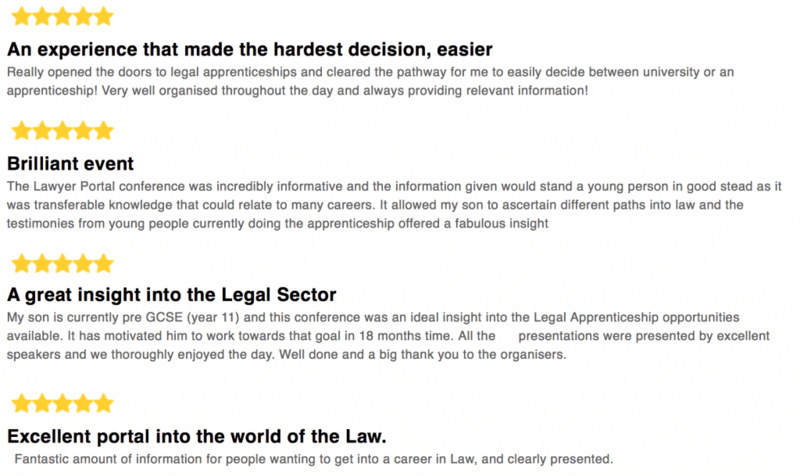 Law Apprenticeship Conference: Why Should I Attend? You will also receive a goody bag, including gifts from firms, companies and all the information you need to start applying! Law Apprenticeship Conference: Why Law Apprenticeships? With over 500,000 apprenticeships now open to GCSE and A-level students in the UK, and the government’s plan for 2.5 million more by 2020, apprenticeships are the incredible new way to begin your legal career. From becoming a solicitor at an international law firm such as Dentons, to working in-house at huge companies including ITV, Coca Cola and Marks & Spencer, there has never been a more exciting time to explore these legal opportunities. Last year, former Lord Chancellor Liz Truss’ suggested that the introduction of 3 million apprenticeships “brings a big opportunity for some of our large legal services firms”, meaning more prominent companies will be putting forward their own apprenticeship offerings. With more in the pipeline, now is the time to take advantage of The Lawyer Portal’s extensive knowledge and experience through the Law Apprenticeship Conference. Law Apprenticeship Conference: What Do Other People Say? There will also be two Q&A panel sessions where you can ask the experts everything you want to know about apprenticeships. To book, just click the link below, select the location and the event date and then enter your name and quantity of tickets. There is a huge demand for our Law Apprenticeship Conference from schools, so if you would like to book for a group greater than 3, please use our group booking form. Just select the Law Apprenticeship Conference from the drop down, select either 3rd November 2018 or 19th January 2019 from the calendar and enter your details to book! Make a group booking through here. Get all the latest information from a qualified lawyer, so you can advise your students as well as possible. Tickets are now FREE! Commercial awareness is becoming a key criteria for 21st Century employability. But what exactly is it? And how can students start developing this essential quality now to greatly enhance their chances of future success – in law or any other business-related profession? Our Commercial Awareness Workshop, delivered at schools, helps teachers and students understand why it is vital not only for aspiring lawyers, but any student considering a commercial course or career. If you’re a teacher looking to improve your students’ university and careers prospects, get in touch today. Commercial Awareness Workshop – What Does It Cover? The workshop is a half-day event and can be run at a your school at a time that suits you. It will leave your students with a better understanding of real world commerce and how to harness it to get ahead. A detailed, interactive exploration of exactly what commercial awareness is, using current examples to illustrate what you need to know and why. A case for why is it so important to law firms and other businesses. What has driven firms in making this an essential part of the 21st Century skills set? A plan of action, outlining how students can gauge their current levels of commercial awareness, and develop these further to make them better candidates for university and beyond. The workshop is aimed at Year 9-12 students who are interested in law, or any other commercially-driven courses or careers. To find out more about how this could work for your school, please register your interest and one of the TLP team will be in touch to discuss how we can help. Get all the latest information from a qualified lawyer, so you can advise your students as well as possible. Tickets are just £30! Do you teach or advise aspiring lawyers? Find out how a 'Law Careers' Insight Day delivered at your school can help! Experiential learning at its best! Enter an exciting courtroom simulation and hone your legal and communication skills. Available at your school! LNAT Tutoring – Get One-on-One Prep from an LNAT Expert! To apply to study law at some universities you will need to do the Law National Aptitude Test, or LNAT. The LNAT consists of aptitude testing skewed heavily towards assessing a student’s verbal reasoning skills. This takes the form of a 95 minute comprehension task, followed by a 40 minute essay. The Lawyer Portal has lawyers and admissions test experts, who can equip students with proven strategies and techniques to excel in this type of verbal reasoning examination. We can also provide systematic techniques that can be applied to the LNAT essay-writing task in order to reduce variance and achieve consistently high scores. Book your private LNAT session today! Would you rather work in a group setting for your LNAT preparation? Book one of our popular LNAT Workshops! Or if you’d prefer to practice online, why not try our Online LNAT Course? What can LNAT Tutoring cover? Developing your understanding of the mechanics of the LNAT test with proven strategies, strengthened through practice. Focusing in on the verbal reasoning component to understand the mechanics of how they work and how you can improve your marks. Honing your essay-writing skills to produce the interesting and balanced pieces that achieve top marks. How do I book LNAT Tutoring? You can book our bespoke LNAT Tutoring in-person at our London Waterloo office or secure online sessions, which can be delivered anywhere in the world. The choice is yours! Sessions are available in 1, 2, 3, 4 or 5 hour slots and can be booked by clicking on the button below. Once you have made a booking, a member of the TLP team will be in touch to confirm your preferred date and time. Prefer to learn in a group? Attend an LNAT Workshop and boost your LNAT score in a half-day session. Prepare to succeed in your training contract interview with this realistic online interview simulation – then get detailed feedback from a qualified lawyer and a full video analysis. There’s 3 distinct interviews to choose from, all created by lawyers who have conquered the training contract interview themselves. Start improving your interview technique online today for just £120. Competition for training contracts is fierce. So, it’s essential that you stand out at every stage of your application. Increasingly, law firms use online interviews to narrow the field. These can be incredibly challenging – especially for the uninitiated. That’s why we have created a realistic simulation of the online interview experience. There are 3 different interviews, all written by experienced lawyers. The questions posed commonly come up at actual training contract interviews. Meanwhile, the platform gives you a realistic taste of what it’s like to be assessed online – something which takes many excellent candidates off guard. Click one of the purple booking buttons on this page. Select your interview from the drop down. We suggest trying all three! After you’ve checked out you will receive an email invitation to the interview platform. When you’re ready, you can access the online interview from your e-mail invitation. You will then be able to complete the interview. It should take around 30 minutes. Shortly after completing your interview, you will receive comprehensive feedback from a qualified lawyer and – crucially – an easily navigable online video of your performance. Get used to performing in an online interview format so you can hit the ground running in your online training contract interview. Remember, you only get one shot! Tackle training contract questions written by top lawyers and legal educators. These are designed to reflect what you will get asked by actual law firms – online and in-person. Access the video of your interview performance online, allowing you to assess your performance on a question-by-question basis. Get detailed written feedback on how you answered each question from top lawyers who know what assessors want. Attend our Training Contract Interview Workshop and hear from a qualified lawyer with years of teaching experience how to stand out! Get one-on-one Training Contract help from a qualified city lawyer with years' of legal teaching experience. Register your interest in our £25 per ticket Training Contract Conferences: definitive Training Contracts events in London and Manchester. 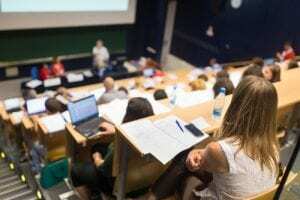 A growing number of UK Universities now require candidates to sit the Law National Aptitude Test (LNAT) to assess their underlying suitability to study law. These include Nottingham, Bristol, Durham, Oxford and UCL. If you are applying to any of these universities, LNAT prep will be crucial to your chances of success. For venues, visit our LNAT Courses 2019: Dates, Venues & Times page. If you are a teacher interested in booking an in-house LNAT workshop for your school, please fill in an enquiry form and one of our team will be in touch to discuss how we can help. We also offer LNAT tutoring for individual students, either in person or over skype. You can book your LNAT tutoring here. 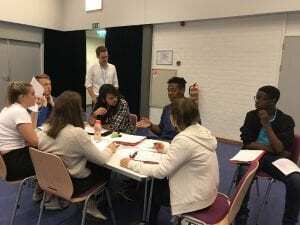 LNAT Workshop 2019 – What Does It Cover? Explaining what the test is and the mechanics behind it. By understanding what the LNAT is like and how it works, you can ensure that you have prepared properly, do not get an unpleasant surprise on the day, and know what you need to do to score highly. Providing proven strategies for the verbal reasoning section of the LNAT exam. We have in-house verbal reasoning experts who analyse year’s of tests and come up with top strategies for specific exams, whether it’s the UKCAT in Medicine or the LNAT in Law. Analysing what the assessors look for in the essay and how to write an excellent essay every time. This is done using a proven system, broken down into repeatable steps. Our assessment experts have designed a formulaic approach to essay writing that reduces variance and ensures you always deliver. LNAT Workshop 2019 – Who Should Attend? 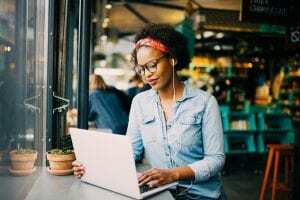 If you’re applying to any of these highly competitive institutions, you will need to make sure you score as highly as possible on your LNAT exam. Hear from lawyers, law students and amazing key note speakers for just £10 per ticket at our inspiring national event! *NEW 2019 DATE ADDED: LONDON! This year, we bring our flagship TLP Aspire event to you in official partnership with BPP Law School. Why not come along to our free one-day event for aspiring lawyers and those that advise them! This event will provide you with an inspiring insight into what a career in law really means. You’ll hear from amazing guest speakers, legal education experts and top lawyers, as well as current law students. The Lawyer Portal Aspire will span exciting insights from the legal front line, all the way through to how to get ahead during the application process. The goal is simply to give you everything you need to take those next steps on the road to a legal career. Want a career in law but not keen on university? Why not book onto our free Law Apprenticeship Conference? Hear from legal experts about law apprenticeships, why they are growing in popularity and how you can get one! TLP Aspire 2019: Why Should I Attend? Receive expert insight from lawyers and experienced legal educators. You’ll receive expert advice on what a career in law really means and how to kick-start yours today. Hear talks from current law students. Find out how to gain legal work experience, how to navigate the application process – and a real insight into what life at law school is really like! Get inspired by our keynote speakers. Discover the range of careers and specialities available to you with a law degree. TLP Aspire 2019: Who Are These Events For? The Lawyer Portal Aspire is designed for all students interested in a career in law from Year 8 upwards – whether you’re committed to becoming a solicitor, barrister or chartered legal executive, simply want to find out more about careers in law, or if you’re considering converting to law and studying GDL. Under 16s are very welcome at these events, provided they are accompanied by a parent, guardian or teacher. For venues, visit our Conferences 2019: Dates, Venues and Times page. There is a huge demand for our TLP Aspire events from schools, so if you would like to book for a group greater than 3, please use our group booking form. Just select the TLP Aspire event you wish to attend from the drop down, select the date from the calendar and enter your details to book! A completely interactive legal simulation for aspiring lawyers and anyone interested in boosting their communication skills. Learn more! Score highly on the LNAT exam with proven strategies from lawyers and admissions test experts. Find out more! The Lawyer Portal’s Mock Trials place you in the dramatic and intellectually-demanding surroundings of a real courtroom experience. The one-day event has been carefully designed by qualified lawyers from top city firms, alongside legal educators with years of teaching at leading institutions. The result is a truly exceptional learning experience. Whether you’re a top international lawyer of tomorrow, or are simply looking to bolster your university applications with improved teamwork and communication skills, Mock Trials are a must-attend event. You will leave the day with a clear understanding of whether a career in law is right for you, a great addition your personal statement, and vastly improved interpersonal skills applicable to any career path. 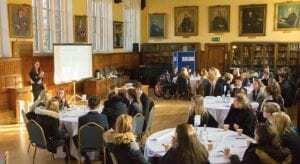 If you are a teacher interested in booking an in-house Mock Trial at your school and customised for you students please get in touch and a member of our team will be happy to tell you more. What do Mock Trials involve? This is your chance to take part in a court room experience that is fast-paced, exciting and enlightening. The Lawyer Portal’s Mock Trials recreate the excitement of the courtroom, while improving your understanding of Law – as well as your global skills set. First, you will be given the background of this – your toughest ever case! You will assume the roles of barristers, jurors and witnesses. As the day unfolds, witnesses will be called (and grilled), evidence will be presented and cross-examinations will ensue, before a final judgement is delivered. As you defend and prosecute in court, you will learn vital lessons about critical thinking, teamwork and public speaking. You will also develop an understanding of the English Legal System – something the Government increasingly deems essential. What do others say about our Mock Trials? 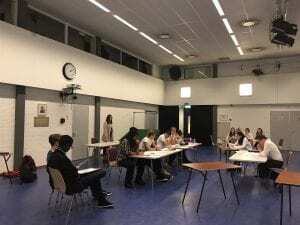 Mock Trials – Who Should Attend? Any student looking to bolster their teamwork and communication skills. TLP’s Mock Trials are an exciting and innovative way to experience law in action. To be the first to hear about upcoming Mock Trials, please register your interest below! Whether a student’s ambition is to defend individuals in court, provide hands-on commercial legal advice to blue chip companies or protect a person’s basic human rights, our ‘Careers in Law’ Insight Day will provide all the information necessary to take those first exciting steps. Designed especially to be delivered in-house at schools, the day is created and delivered by experienced lawyers. It provides Year 9-12 students with a broad overview of the various careers falling under the umbrella of law, before focusing more particularly on how to become a solicitor, barrister or chartered legal executive. If you are a teacher interested in booking a ‘Careers in Law’ Insight Day for your school, please get in touch. 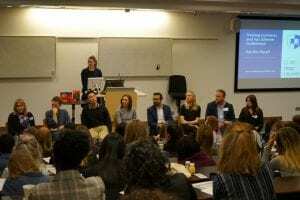 Why do a ‘Careers in Law’ Insight Day? The overarching aim of our Insight Day is to positively engage students in a relaxed environment, where they will feel confident to ask questions and take part in fun and interactive law-related activities. Simply wondering what a career in law entails. By the end of the day, students will be in a solid position to decide whether law is right for them and what’s required to get started and get ahead. 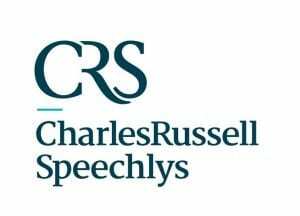 What does a ‘Careers in Law’ Insight Day Involve? 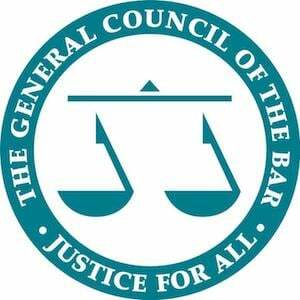 The practical legal training required to qualify as either a barrister, solicitor or chartered legal executive. A mock negotiation will round off the day. This is designed to encourage teamwork, communication, compromise, strategical thinking and decision making, giving students a true flavour of what they will encounter in everyday legal practice, as well as the types of skills they will be expected to employ as fully fledged lawyers. What do others say about our ‘Careers in Law’ Insight Day? 09.15 - 09.30 Introduction to Law - Is Law Right For Me? Experiential learning at its best! Enter an exciting courtroom simulation and hone your legal and communication skills. It's for aspiring lawyers and anyone looking improve their debating prowess. Attend an LNAT workshop and score highly on The Law National Apititude Test required by leading universities in the UK. Commercial Awareness is the key to 21st century employability. Boost your students' chances of getting into the course and career they want!